Thank You, Mr Pinder, Mr Westwood, Mr Godby, Mr Romanin and Mr Remilton. A certain sadness falls on us this weekend as the last of the Boeing engineers make the most of their last weekend of R&R in London with only tomorrow remaining for them to add their talents in coaxing VH-XBA out of her slumber. Although I have had only a week with them, it was obvious when I met them on my arrival that they had become very much part of the family in the short time they had been here. The same enthusiasm that had been a hallmark of the volunteers from Qantas backgrounds was evident in exactly the same way with the Queensland volunteers. The fit was perfect. So, who are these cavalrymen who have ridden to our assistance? Well, for starters they are blessed with a commodity rare, nay extinct, among the original group (Ben Hunter excepted) - youth! What vigour these fellows have, the oldest being only 52, the youngest 32. Only one, Ross Remilton, was born when this aero was delivered. Indeed some were not even born when the 747 first flew. Their careers have started in many different areas, Nick Pinder and Brett Godby in the RAAF, Ross Remilton in Bush Pilots in Cairns, Fab Romanin with Boeing and Chris Westwood with Qantas. 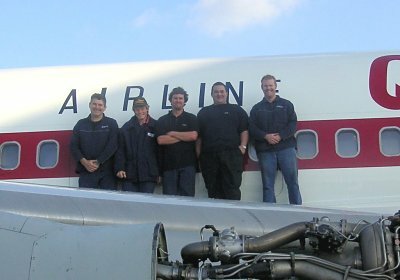 They are all employed by Boeing Australia at Amberley, Queensland where 707s are almost as common as they are in Southend, so the type is no stranger to them, with their experience there ranging from 9 years to 2. What they do have in spades is the desire to see the project succeed, not an uncommon result of exposure to XBA. Just as the ATC Lashams supporters have, so have these Boeing guys been enthused by the prospect of a once abandoned aeroplane being returned to the skies once again. It's a phenomenon that always amazes. To that end, Nick Pinder and Chris Westwood have become a pair of polished performers when it comes to Fuel Control Unit removal, installation and rigging. After the failure of two engines to attain take-off thrust, Peter has decreed that all 4 FCUs will be changed out and Nick and Chris have been the carby specialists. We still await a replacement for #4 but all the others have been removed, replaced and rigged by this duo. If the last FCU had been available, it would have been dispatched in very short order with all the practice they've had. The sparkie strength has been increased with the arrival of Brett Godby, the Boeing avionics engineer who together with Denis Martin, Paul Wilkinson, Norm Mackay and Dave Short worked hard to acquit a fuel pump wiring Airworthiness Directive that was a major part of the avionic workload. Brett was also our man when a fuel quantity probe change was done in #2 Main Tank and to see him squeeze himself through that tank access hole was a sight to see. To see him emerge victorious was even better. What can we say about Fab Romanin? If there is a sheetie's Olympics held, he'll be our Aussie representative. The sheet metal work cards were many and vast when the combined eyes of a dozen other trades were trained on the structure during their respective inspections and with no dedicated sheet metal man to attack them, they became a worry to Peter. Fab's arrival has assuaged Peter's furrowed brow considerably, and Fab's above and beyond approach to this project has been gratefully received by all of us who were stuck at a hurdle when that last anchor nut wasn't there or the panel we wanted to install had a missing rivet or three. Fixed in a wink and with a smile. Now the quiet man. Ross Remilton take a bow. There are many jobs in a project such as this that carry no glamour or prestige. I know because I generally get them. Among the crappiest is the replacement of the gap panels, the bits of tin that cover space between the struts and the wing leading edge. Fitted with that abominable device, the Dzus fastener, they didn't fit properly when the aeroplane was new and they certainly don't improve with time. Ross has plugged away at them, never complaining, never cursing, instead, proving that persistence will defeat most things, he has persisted and won. So ladies and gentlemen, put your hands together for the Boeing boys, Nick, Chris, Brett, Fab and Ross. Fellas, when eventually we do do it, we will long remember that we couldn't have done it without you. From the entire QFM 707 Preservation Project Team, a most sincere Thank You Very, Very Much.